If you’re planning a dirt bike ride where you think there will be some water crossings, knowing how to restart a drowned dirt bike may save you a whole lot of trouble and get you out of the bush. So if you have no choice and you’re crossing the stream, the second you realize you’re going to drop it, the best thing you can do is hit the kill switch before it goes under. This will at least stop the engine sucking in a lungful of water. Water doesn’t compress, so if you’re quick enough you will prevent a bent conrod, broken piston, and total engine rebuild. Get your bike upright and onto dry land as quick as possible. If you’re riding with some buddies ask them for help. You’d do the same for them. Remove the spark plug, tank and seat. Remove the air filter and drain the water from the air box. Turn the petrol switch off. Tip the bike backwards on the back wheel like you’re doing a wheelie (with the help of your buddies) to drain the water from the exhaust pipe. Push the kickstart down with your hand 8-10 times to pump the water out of the plug hole. If your bike doesn’t have a kickstart or it is a light two-stroke you may even be able to tip the bike completely upside down resting on the seat and handlebars. Put the bike into top gear and spin the back wheel to pump the water out of the plug hole. Put the bike back on its wheels and remove the drain plug from the carby float bowl. If your bike is fuel injected you can skip this step. Drain the petrol and any water that may be in there, then refit the plug. Wring out the air filter foam element as best you can and refit it. If you have the time, sit the air filter and spark plug in the sun for a few minutes. Dry off the spark plug with a rag, or put a new one in if you’re carrying one in your Bumbag toolkit. If it was a quick dip, the electrics should be fine, it’s just like riding in the heavy rain, but if you’ve got some trusty WD40 it will help to give the wiring a spray. Try to restart the bike. If it fires back into life you’re in luck. If not, you’re up for a walk or tow back to the car. Replace the exhaust packing if lots of water went in. Run the engine briefly. Check the engine oil to see if it looks foamy or creamy. This means there is still water in the oil. If it is, change the oil again. You may have to do this several times until the oil is clear. If it was a long submersion, water will have gotten into the crankcase. Cold water mixed with a hot engine is never a good thing. Don’t ride the bike if there is water still in the oil, you will destroy the engine! If it was a long submersion, water will have gotten into the crankcase oil and you may be up for a complete overhaul. 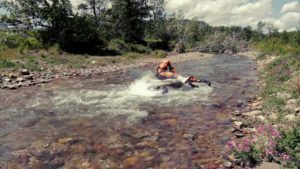 As I’ve said, it’s best to avoid a water crossing altogether by taking another route, but if you have no choice, I hope these steps can get you going again if you find yourself having to restart a drowned dirt bike. If you have any questions or comments, please feel free to leave a message below.